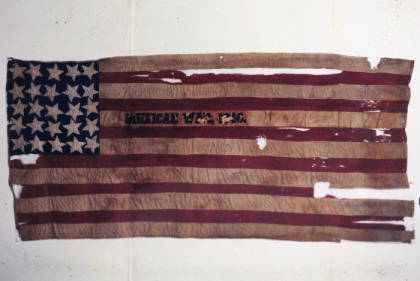 Difference between revisions of "Mexican War"
| caption = National colors of the 4th Ohio Volunteer Infantry. Text on flag reads: Mexican War 1846. The Mexican War was a major conflict between the United States and Mexico from 1846 to 1848. During the 1820s and the 1830s, thousands of Americans moved to Texas. In the early 1830s, the Mexican government enacted a series of laws designed to control the recent American immigrants to Texas. In 1836, Texans rose up against Mexico and secured their freedom. The Mexican government refused to recognize Texas' independence. As soon as they had achieved their independence, Texans lobbied the United States government for admittance to the Union. Admission was refused, primarily because many people thought that the admittance of Texas as a slave state would upset the balance between free and slave states. For the next nine years, Texas was an independent country. Texans still lobbied to join the United States. In the presidential election of 1844, James Knox Polk, the Democratic Party's candidate, won against Henry Clay, the Whig Party's candidate. Polk campaigned on the issue of expansion, and called for the annexation of Texas. In 1845, President John Tyler formally approved the annexation of Texas. As soon as Tyler annexed Texas, Mexico broke off diplomatic relations with the United States. The two nations also became embroiled in a border dispute. The United States claimed that the Texas-Mexico border was the Rio Grande. Mexico contended that the correct border was the more northerly Nueces River. Upon taking office, Polk immediately dispatched Zachary Taylor with 3,500 soldiers to the Nueces River to defend the land claims of the United States. At the same time that Polk sent the soldiers to the disputed area, he also dispatched John Slidell to Mexico to offer thirty million dollars to the Mexican government for the New Mexico Territory, California, and to establish the border of Texas at the Rio Grande. The Mexican government refused to meet with Slidell. In January 1846, President Polk ordered Taylor's army to advance to the Rio Grande. In April, Mexican forces attacked Taylor's army. Polk went before Congress and asked for a declaration of war for Mexico's unwarranted aggression. The Congress agreed and formally declared war on May 13, 1846. Polk ordered Zachary Taylor to advance into northern Mexico. In September, Taylor's army captured the city of Monterrey. Stephen Kearney and a force of nine hundred men secured New Mexico. His army then marched to California. With the assistance of John Fremont and a group of Americans already residing there, Kearney took control of California for the United States. Despite these setbacks, the Mexican government refused to surrender. In 1847, Polk sent General Winfield Scott and an army of twelve thousand men to capture Vera Cruz. Scott's force then advanced upon Mexico City and captured Mexico's capital city in September 1847. The Mexican government now had no choice but to seek peace with the United States. On February 2, 1848, Mexico and the United States signed the Treaty of Guadalupe Hidalgo. Mexico acknowledged the Rio Grande as the border between Mexico and Texas. It also ceded New Mexico and California to the United States. In return, the United States paid Mexico fifteen million dollars and assumed approximately two million dollars in claims that American citizens had filed against the Mexican government and businesses. In Ohio, like most Northern states, there was strong opposition to the Mexican War. Many Northern Whig and Liberty Party members believed that Polk only sought the territory acquired from Mexico to extend slavery. Most abolitionists opposed the war and slavery on moral grounds. Other Northerners did not want to compete with Southern slaveholders in any territory acquired from Mexico. In 1846, David Wilmot, a Democratic member of the United States House of Representatives from Pennsylvania, proposed the Wilmot Proviso. The Wilmot Proviso would have prevented slavery's expansion into any of the new territory acquired during the Mexican War. The House of Representatives approved the proviso on August 8, 1846, but the Senate adjourned before it could debate the bill. The House adopted the proviso again in its next session. On February 1, 1847, the Senate rejected the proviso. As a result, the proviso never went into effect. The proviso passed the House of Representatives because a majority of the representatives came from the North. Under the United States Constitution, each state received a number of representatives based on a state's population. The North had more people than the South. In the Senate, there were the same number of slave and free states. Each state was entitled to two senators. When the Northern and Southern senators voted along regional lines, a bill could not be approved. Northern and Southern states intentionally tried to maintain the balance between slave and free states. As long as neither side had an advantage in the Senate, a bill could not be sent to the president to sign a law that could either end slavery or make it legal everywhere. The Wilmot Proviso further divided the North and the South over the issue of slavery. Many Southerners believed that slavery should be legal everywhere in the United States. A growing number of Northerners, including many Ohioans, opposed slavery's expansion. The Wilmot Proviso expressed the philosophy of the Free Soil Party and the later Republican Party that slavery should not expand. Approximately seven thousand Ohioans enlisted in the United States army during the Mexican War. Most of these men served under Zachary Taylor in northern Mexico. National colors of the 4th Ohio Volunteer Infantry. Text on flag reads: Mexican War 1846.